In this tutorial we will see how to export a model from TexTools, import it into 3ds Max, and import back to TexTools after its been modified. Tutorial Coverage This tutorial is meant to give the basics of how to get a model from TexTools into 3DS Max, and what the model looks like in the application. This is NOT a tutorial on how to use 3DS Max, if you would like to know how to use the application there are plenty of tutorials openly available that can be found with a simple google search. Installation is self explanatory, just follow the prompts for 3DS. 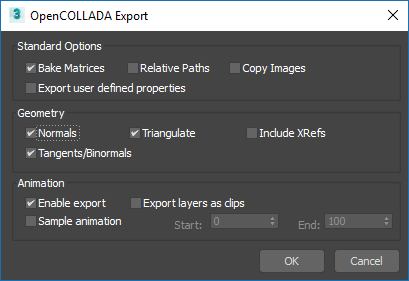 The openCOLLADA plugin has installation instructions in the zip file. 3DS Tutorial Version In this tutorial I will be using 3DS MAX 2017, but older/newer versions should work. For simplicity I will be using the first model in the list, Abes Jacket, head to the 3D model tab of the item, and select Export Model + Materials. Navigate to the folder that contains your model. The model is broken up into separate groups based on their mesh number, and then into several different parts, this is based on how the model is set up in the official files. Import Restrictions You can NOT add more groups or mesh parts to the model and import into TexTools, the number of meshes and mesh parts should be equal to or less than the original model. TexTools will throw an error if there are too many meshes. In the Save window navigate to the same folder that was used to import the file, Change the save type to OpenCOLLADA, and click on Save. You will be asked if you want to replace the file, select Yes. These are the settings you will want to use when exporting the model. Now that the file is modified and saved, we click on Import in TexTools. In this instance I deleted some parts of a mesh, and a warning popped up letting me know that this may cause issues in the game, as it is only a warning, TexTools still imports the model.